Perfect for a couple but can sleep more if another area is opened. Look no further... this totally (upscale) furnished Los Angeles private estate-guest house is a perfect little paradise for one person, a couple or family. There is a secret room behind a bookcase that leads to a finished attic that can accommodate 4 children or adventurous adults if needed for an additional cost $100.00 per nt. Feel like you're in the tropics in your own home away from home. This quiet cul-de-sac street offers a serene environment for a writer or a movie industry executive who wants a peaceful setting to come home to. It has been home to many celebrities. It's an enchanting oasis. Entertain friends around the fire pit or have your business meetings at the gazebo bar. Or just enjoy a hot jacuzzi at the end of a hard day. Private patio and BBQ area. The owner, Georgia Durante lives on the property and is available to assist you with any needs you may have to make your stay more enjoyable while giving you privacy. Pool is not heated in winter--can be 4 extra cost. A kitty lives in the main house, but has never been in the rental unit. Highly allergic people should take note. If you have a larger family the secret room can be opened for an additional $100.00 per night. Another very large living room with a stone fireplace is included in this rental, creating 1000 more sq. ft. The secret room is a finished attic behind a bookcase. You need to be old enough (or young enough) to climb a ladder. Kids and adventurous adults love this room. It has a great view of the grounds. There are 4 twin size beds in the secret room and room enough for a queen size air bed. Please note, if renting the secret room, tenants will need to climb a ladder to access the space. Tenant is aware that this is not recommended for very young children or elderly adults. The Secret Room is ideal for children but may not be comfortable for tall adults with the low ceiling. Owner will not be responsible for any unforeseen accidents resulting from the use of the ladder. Has a very large living room with a fireplace and two very comfortable down couches. At night it becomes the bedroom by pulling the queen size (plush Mattress) Murphy bed. It has a full kitchen with all that is needed for cooking. The breakfast room is octagon shaped with French windows on all sides. Very bright and cheerful room which looks out to the pool and outside fireplace. Romantic Poolside Dinners & Events/filming: The Enchanted Manor is magical, especially at night. 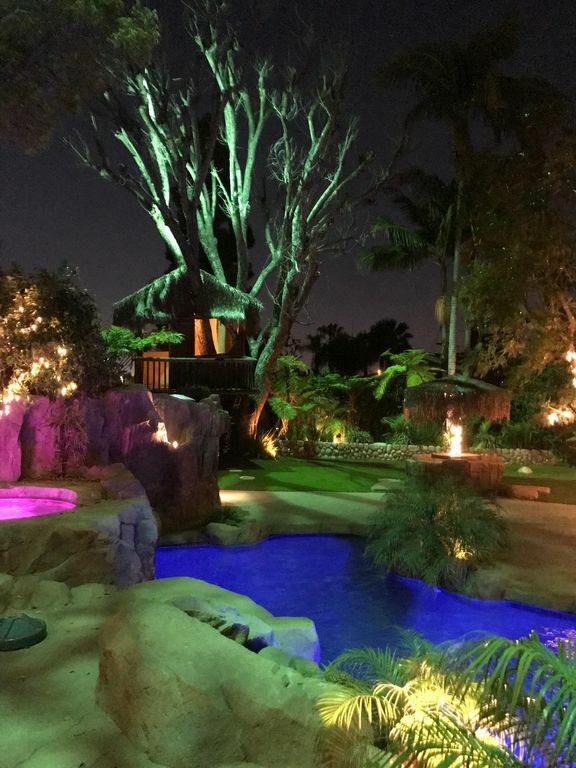 The lighting on the grounds, trees, deck and pool turns the night into a very romantic atmosphere. Celebrity Chef, Kurt (personal chef to Ronald Reagan)is available to cook for private dinners. Massage therapist also available. Vacation renters are not allowed to have parties with several people. The cost for a party is $2500.00 for a five hour event for up to 50 people. Scenes from the Lifetime Movie, 'William & Kate' were shot here as well as other feature films and commercials. The outside fireplace is on a private patio off the breakfast room. It's like having anther living room outside With plush out door couches and coffee table. This area also has a BBQ. There is another BBQ on the 3rd level of the deck next to the fire pit. Sitting around the fire pit at night with the kids roasting marsh mellows is a wonderful family experience. Having business meetings around the gazebo bar. The play house is a mini version of the main house. It has 2 twin size beds, Cable TV, fireplace and a phone line. It is equipped with child size furniture and toys. The children also have their own patio and patio furniture. It's like a Disneyland here for kids. The tree house is another adventure for them to explore. Many more photo's can be seen on the Fan page for The Enchanted Manor on Face book. The house is on a tree lined cul de sac. Very secure area. The house has an alarm and security cameras around the perimiter for more peace of mind. No parties without permission from the owner. Hi!! My name is Georgia Durante. I am a Stunt Driver and the author of 'The Company She Keeps' (my autobiography) which has recently been optioned for a movie. I purchased my property in 1983 and it has been an ongoing labor of love every since. Over the years I have put in over a million dollars, creating a magical paradise. The original size of the home was 2800 sq.ft. It is now 5000 sq. ft. I am 62 years old and I have adopted a baby girl in 2006. I have elected to stay at home and be a mom. Renting my property is a way of making an income which allows me to be at home rather than on location. I have built a play house and tree house on the property (inspired by my daughter) which is a real plus for renter's with young children. The play house is a mini version of the main house with a river rock exterior, bay windows, skylights, custom made child size leather couch, bunk beds, cable TV, phone line, fireplace and camera system to monitor the children from inside the house. It has it's own patio with a child size umbrella table. It truly is a child's wonderland. People come here as strangers and leave as friends. I live on the property, but your privacy is respected. I am available 24hours a day to help to make your stay an enjoyable adventure. This property is centrally located to many attractions in the Los Angeles area. Just blocks from the 101 and 405 freeways. I love the quiet of the cul de sac street and the LA River behind the property is a great buffer for any street noise. It's in the middle of all that LA has to offer, yet you feel like your on your own private Island. People come just to relax around the pool and jacuzzi with 3 waterfalls, or have business meetings around the fire pit or gazebo bar. It's a serene tropical atmosphere. It's romantic for couples and a disneyland for kids. It has it all! In this cozy magical creation, I enjoy having friends over to cook out and sit around the fire pit with a glass of wine when I don't have guest. The jacuzzi usually gets utilized before the night is over. The entire back yard is lit with lights in all the trees and the pool lights change colors every few minutes. It's eye candy for all my guest. It feels like a fairyland. I am a writer. I can not ask for a better environment to write. It's so peaceful here. No need to ever go out. It's all right here. You'll find it difficult to leave the property to go sightseeing. If you book a week or longer, I give you an autographed book and a few other goodie when you leave. There is an outdoor shower nestled in a rock formation cave behind the jacuzzi. Outside Fireplace on Private Patio. There is also a fire pit. Don't forget the marsh-mellows. Directly in front of house. Steps away from front door. Everything for cooking that you need. There are also outside dinning tables besides the breakfast room indoors. Large selection of the latest movies and also many children's movies. Artificial turf in backyard, green all year around. Must be cautious not to put out cigarettes on lawn or empty drinks. Outside patio. No smoking in unit. The SALT WATER lagoon type pool has 3 water falls. It is not heated in the winter but can be for an additional cost. The Jacuzzi has a ledge behind the water fall for seating. Smoking is allowed on the outside private patio and pool area. Security cameras and alarm system for peace of mind. I don't leave reviews on most places, so when I do it's really good or really bad. My wife & I stayed there 4 days. We had the most awesome time, the back yard area is unbelievable, especially the Jacuzzi at night with the waterfall. It makes you feel 20 years younger when you go in it. The name Enchanted Manor describes this place well. I thought my home was nice until I stayed there. Georgia spent many years making it like it is. She also is great host and a very gracious woman. If your lucky enough to have her tell you her life story it will amaze you. She has a saying "come as strangers, leave as friends". That is so true. We will be coming back soon. Also it is centrally located to many of the major attractions in LA. Thank you Georgia for a wonderful time!!! Phil & Debbie. My family loved staying here. It was close to all the touristy things we wanted to do, we liked being in a house instead of a hotel. The outdoor area is amazing and so relaxing after a long day of touring. My kids loved the secret room, pool, hot tub and fire pit! The enchanted manner was not only enchantedly BEAUTIFUL, but Georgia the owner was absolutely AMAZING!! She was more than accommodating and helpful throughout everything, and helped The Bride during a disaster on the actual wedding day!!! Georgia has been nothing but amazing, sweet, helpful and, plain and simply PERFECT! She made OUR WEDDDING DAY ENCHANTED!!! Thank you Georgia we love you!!! Thank you Darlene and DannY it’s always my pleasure to make your day special. As you are very special people. It was a very unique property. It would be a great place for a private party with beautiful outdoor area with lots of seating space. We made s'mores one night in the firepit which were delicious. The hot tub was great. Wish could have turned it on ourselves rather than asking Georgia to warm it up. We didn't get much use of the pool because it was not heated. Good location near most LA attractions. Georgia was a great hostess and is a published author with great stories to tell. It was a pleasure having your family here. I hope you will come back again in the summer months when the pool is like bath water. Unfortunately one of my tenants messed up the controls for the jacuzzi and there is no way to fix it. The good thing is I can be anywhere in the world and turn on the jacuzzi. I will look forward to your next visit! Close to Universal Studio's (2 miles away) Beverly Hills-8 minutes away. 101 and 405 freeways are minutes away. Very centrally located to all major LA attractions and Movie Studios. If Secret Room / Great Room is rented, add $100.00 per night. You are allowed to have visitors but over 10 people is considered an event and there will be fees.